Trust fund growth reduced due to $1 trillion in lost annual earnings. According to the latest Social Security Trustees' report released today, the projected shortfall in the financing of Social Security over the 75-year planning period is 2.67 percent of taxable earnings, compared with 2.22 percent in last year's report. By far the largest factor in this change is the Trustees' assumptions regarding the current and future economy, which accounted for nearly half of the total change. In particular, the Trustees revised down their projections of average hours worked. Last year, the intermediate assumption was that average hours would not change over time, while this year they are assumed to fall 0.05 percent per year. Over the 75-year planning period, this implies an eventual fall in hours by about 4 percent. As a result, growth in average annual earnings was similarly revised downward. According to this intermediate projection, the Social Security trust fund will run out of money in 2033, compared with 2036 in last year's estimate. Though this date has moved earlier in recent years, this is overwhelmingly the result of the deep and prolonged recession that began in 2007. As workers have found themselves without jobs, Social Security has received fewer contributions. The 2007 Trustees' Report projected 169.0 million workers in 2011 earning $6.5 trillion in taxable earnings. Last year, there were only 157.7 million workers earning $5.5 trillion. Despite this extraordinary strain on the program's finances, the exhaustion date is four years later than projected in 1997. Furthermore, Social Security ran a surplus in 2011 -- increasing the assets of the trust fund by more than $69 billion over the year. In one form or another, the alternative to a modest hike is a cut in promised benefits. Though current retirees likely would be shielded from the bulk of such cuts, today's workers will be overwhelmingly dependent on Social Security to fund their retirements in the face of the loss of private defined-benefit pensions, and the loss of savings in both the stock market and housing bubbles. 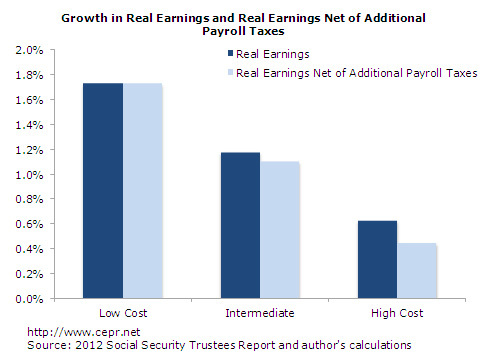 On the other hand, increasing payroll taxes go hand-in-hand with increased life expectancy. Of much more concern is the divergence in life expectancies that has denied lower-income workers the additional benefits that they paid for during their working years. Thus, a broken private health-care system proves to have a much more serious impact on workers' lives during than any financing troubles in Social Security. Expensive and wasteful private health care carries over into the relatively more efficient public systems, and as a result the Medicare Hospital Insurance (HI) trust fund has been under pressure for some time and has been in deficit since 2008. In the short run, the HI program's finances have, like Social Security, been hit negatively by the recession. In 2007, the program had been projected to run very small surpluses through 2010. The $1 billion shortfall then projected for 2011 turned out to be $28 billion. At the same time, the long-term outlook for Medicare has been greatly improved over this time as a result of the Affordable Care Act. In 2007, the HI trust fund was projected to be exhausted in 2019 and run a long-term deficit of 3.55 percent of taxable payroll. In this year's estimate, the exhaustion date is projected to be 2024, as was projected last year. Still, as a share of payroll, the shortfall in the trust fund for Medicare is projected to be 1.35 percent of future taxable payroll, compared with 0.79 percent in last year's report. The difference is due in large part to revised projections of long-run growth in health care costs. CEPR's Social Security Byte is published each year upon release of the Social Security Trustees' report.